If it’s an elegant outdoor structured you are after for entertainment and relaxation, it’s hard to go past Adelaide gazebos. Once mainly used as bandstands in community parks, gazebos are now relatively common in the suburban backyard. Gazebos are generally freestanding, although can be attached to a house, fence or other outdoor structure. They are often hexagonal or octagonal in shape and have a beautiful dome-like roof. The addition of frets and lattice is also quite common. Adelaide gazebos provide wonderful shade and shelter and are great spots to enjoy peace, tranquillity and, if you’re lucky, a nice view. While traditionally built from hardwood, these days gazebos can be built from a variety of materials, included treated pine. If low-maintenance is important for you, you might also consider a gazebo built from steel or aluminium. 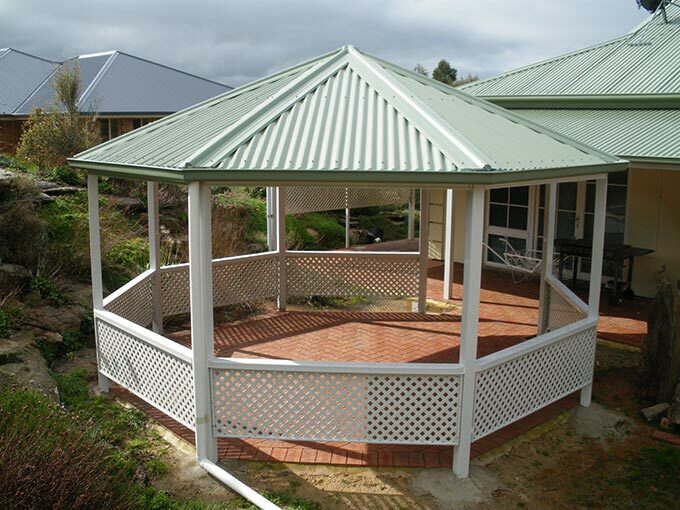 Add a Colorbond roof and your gazebo will be virtually maintenance free. If you’re considering a gazebo for your house, give Outside Concepts a call. We can advise you on all aspects of the project, including the location and the best materials for your needs. Call today for a free quote and you can be enjoying a gazebo quicker than you think. Concept to clean up. 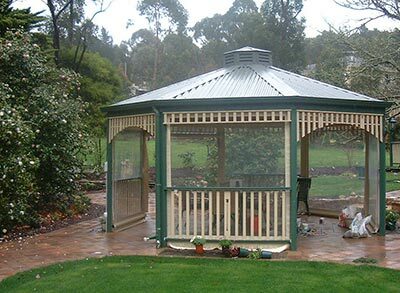 Call Outside Concepts for a free quote on 1800 601 674 for your Adelaide gazebo.